There comes a time when shirts have served their purpose and need to be retired. That doesn’t mean, however, that you have to throw them away. Learning how to make a headband out of a shirt simply requires some cutting, gluing, trimming, sewing and, most of all, practice. Here are some of our favorite patterns. The Celtic knot represents infinity, eternity, longevity and good luck in new adventures. It makes the perfect gift for a young lady undertaking a new challenge. At the bottom of the T-shirt cut off the bottom edge that’s hemmed. Through the 2 layers, cut two 1-1/2″ wide strips (each strip should have 2 layers). Stretch the strips so they start to curl. Make a loop with one of the 2-layered strips by crossing the right tail over the left. Keep the loop at the top and the two 4″ tails at the bottom. Lay the second 2-layered strip in a U-shape over the first with the tails at the top. Place the right side of the upper layer under the tail on the right side of the bottom layer. Place the left side of the upper layer under the loop of the bottom layer. Working right to left, weave the right tail of the upper layer over the bottom loop, under the upper layer on the left and over the bottom layer loop to the left. It will look something like a pretzel. Pull the 4 tails slowly and gently until a knot is created in the center. You can either center the knot in the headband or place it slightly off-centered. Measure the head of the wearer and cut the ends where marked. Cut a single layer of T-shirt 2-1/2″x3-1/2″. Place the tails on top of the square just cut. Spread some hot glue on the tails of the headband as well as the square. Roll the square tightly overlapping the ends. It’s going to be hot so be careful. Let the glue dry before putting it on. Connect the ends of the 6 pieces of 24″ T-shirt strips with a few whip stitches through all thicknesses alternating colors. Tie a knot on the sewn end and secure it in something while you work. Separate the strips alternating colors. Working left to right, weave the 1st strip on the left in and out of all strips. You’ll end up going over the 3 alternate colored strips and under the same colored strips. In other words, the first strip will go over the 2nd, under the 3rd, over the 4th, under the 5th and over the 6th. Repeat the pattern until you get to the end of all strands. Secure the ends by stacking and then putting several whip stitches through all thicknesses. Untie the knot at the other end, measure to make sure it’s the right length, trim if necessary and sew the two ends together on the inside so the seam won’t show when worn. NOTE: Make sure if you have to trim the length that you tack the cut end again so it doesn’t unravel before you sew the two ends together. Take the first of the smaller strips, fold it in half and run a gathering stitch along the raw edges. Pull the thread tight so that the fabric gathers. Roll it into a tight circle then tack it together with your needle and thread. This creates the flower bud. Repeat the process with the other 2 strips so you end up with 3 flower buds. Arrange the flower buds on the headband making sure that one is over the section where the headband was sewn together and tack them in place securely with the needle and thread. 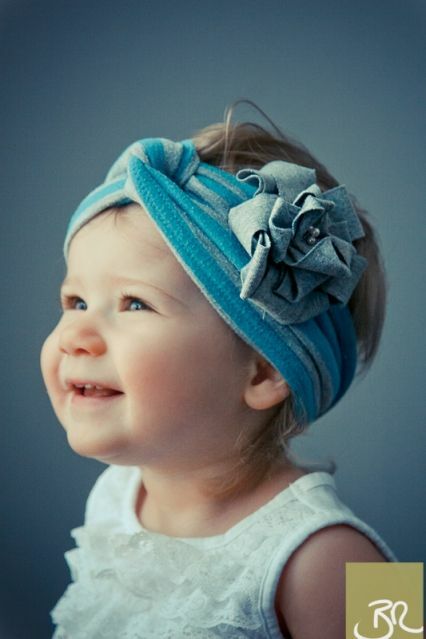 This fast and easy turban is cute, warm and a piece-of-cake to make. Rhinestone button or other embellishment for the center of the flower that has a way to sew it on. Cut the bottom off a T-shirt. Measure the head of your baby then subtract 1″. Cut two strips of T-shirt material double the width of the size you want the turban and as long as the head measurement of your baby. You would end up with 2 strips 6″x12″, for instance, if you want a turban 3″ wide for a baby with a 12″ head. Fold each piece of the cut T-shirt in half and sew the raw edges together. You have made 2 tubes. Turn the tubes right-side-out by attaching the safety pin to one side of one end of the tube then pushing it through the middle until it comes out the other side. Grab the safety pin and pull the right side of the material through the center of the wrong side of the tube while working the wrong side down. Lay the 2 tubes on the table in a “+” pattern. Fold the left side of the “+” over the cross piece and line up the 2 tails. Fold the top of the “+” under the folded tube and line up the 2 tails of that tube. Take the 2 tails at the bottom and, while holding the 2 tails on the right, pull it out to the left. At this point your 2 tubes will make a straight line but one tube will be folded over the other so there’s a knot in the center. Make a circle and put the 4 tails together being sure not to twist it. Sew all thicknesses together making a seam that goes from one edge to the other. Turn it right side out so the seam is on the inside. Cut 1 strip of any type of shirt material (the stiffer the better) 24″ long and 1″ wide. Cut 1 strip of the same material 12″ long and 1″ wide. Take the longer strip and holding one end, make small loops in “X” patterns in a circle until you reach the beginning. Don’t worry if you haven’t used all the material. Just trim off the extra. While holding the “bow” take a few stitches through all thicknesses and tie a knot on the bottom but don’t cut the thread. You have just made the bottom layer of the flower. With the shorter ribbon make the second layer of petals using the same process only make the loops slightly smaller around the entire circle. Sew the top layer onto the bottom by running the needle and thread through all thicknesses several times then tie a knot on the bottom. Do not cut the thread. Add the button to the center of the flower securing it with several stitches. Do not cut the thread. 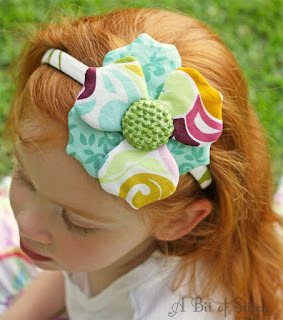 Place the flower on the headband to the side of the knot and sew it in place. Knot the thread, run the length through center of the tube of the headband a short way, pull it slightly and cut it off. That will prevent the loose ends of the thread from showing. 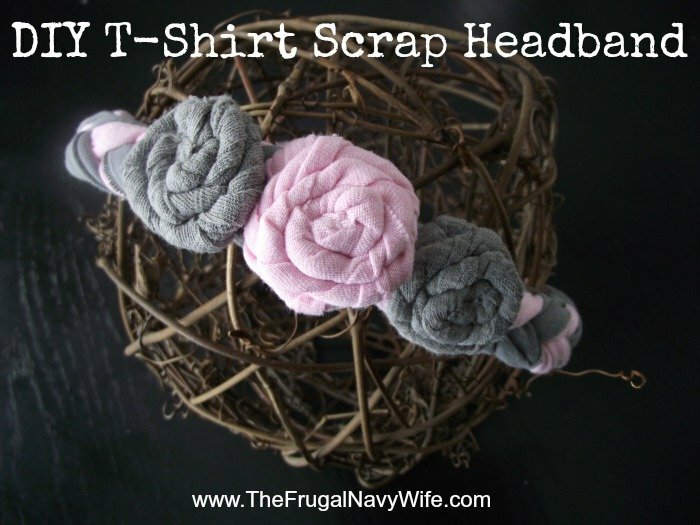 This is a super simple way to turn an ordinary plastic headband into something really special. Measure the headband and add 1/2″. Cut a strip of the shirt as long as the measurement and 2″ wide. Holding the headband, place one end 1/4″ from the end of the fabric and center it. Place a 2″-3″ section of glue to the back, pull the material from the back forward, place it on top the glue and hold it in place for 10 seconds. Continue working the length of the headband until you get to the other end smoothing it out as you go. You should end up with 1/4″ extra at the other end. At the beginning, put a dot of glue where the headband ends and fold up the extra fabric pressing it over the glue and holding it in place a few seconds. Turn the headband so you can do the other side the same way pulling the fabric taunt as you go. Any fabric that hangs over the edge should be trimmed off prior to gluing. That will most likely happen at the ears. Burn wave one end of the grosgrain ribbon under the lighter flame to seal it so it doesn’t ravel. Put a short strip of glue on the underside of one end of the headband and place the ribbon over it to cover the seam. Continue working in short sections until you get near the other end. Before putting the final strip in place, cut the ribbon to length and seal the end with the lighter then put the final strip of glue on the back of the headband and press the ribbon in place. Hold it tightly for 10-15 seconds. Measure a short piece of grosgrain ribbon around the width of the headband where it begins to curve, cut it and seal both ends with the lighter. On the underside only, place a dot of glue and press one end of the short ribbon in place holding it for 10-15 seconds. Wrap the ribbon around the width of the headband, place a dot of glue over the ribbon you just glued down on the back and place the other end of the ribbon in place holding it for a few seconds. This will create a strip on the front where you can slip alligator clipped flowers and embellishments through the loop. You can easily change them out with every outfit. If you need a headband with a little more versatility then try this one. It can cover a lot of hair or only a little. Cut a rectangle of fabric from the back of the shirt 16″x8″. Cut a 2nd rectangle 3″x12″. Fold the edges of the ends of the rectangles down twice, iron and top stitch. With right sides together lengthwise, seam the raw edges of each rectangle. You have just made 2 tubes. Turn the tubes right side out by putting the safety pin on one side of the open end, running it through the inside of the tube and pulling it through while running your hand over the outside. Press each tube flat with the iron with the seam running down the center of the back. On the longer tube, run a gathering stitch across each end. Pull the threads to gather. Place it over your head and measure the distance of the gap between each end. Cut the elastic the distance measured. Run the elastic through the center of the smaller tube and top stitch securing it to the longer tube. Pull each end of the shorter tube over the elastic/band connection and top stitch in place. 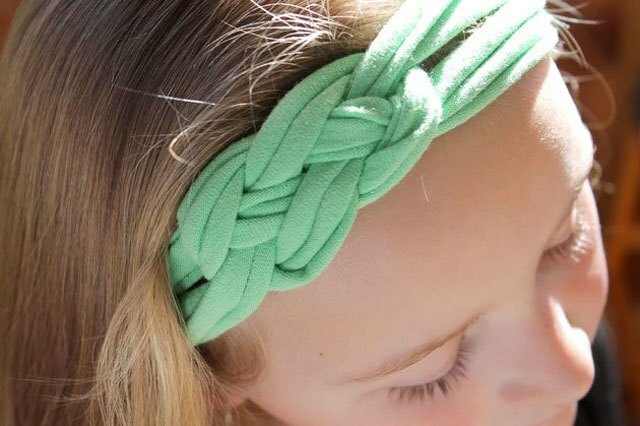 You don’t have to only use T-shirts to make beautiful headbands and you don’t necessarily need to know how to braid. Once made you can add jewels, buttons, fake flowers or anything else you may want to make it even more special as well as personalize it for yourself or that special little someone. Anyone can learn how to make a headband out of a shirt, just have fun while you’re experimenting.